The Heiltskuk (also written Ha-Iltzuk) Icefield covers an area of approximately 3,600 square kilometers (1,389 square miles) in the southern Coast Mountains of British Columbia. 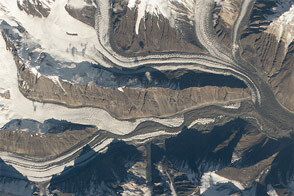 This detailed astronaut photograph illustrates the icefield—mostly covered by snow across the upper mountain slopes—and two major valley glaciers that extend from it. Valley glaciers are large masses of slowly flowing ice and entrained debris that move downhill, carving out wide U-shaped valleys in the process. The locations of former valley glaciers can frequently be identified by the presence of these U-shaped valleys on a now glacier-free landscape. 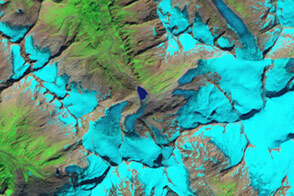 The two largest valley glaciers in the image, Silverthrone Glacier and Klinaklini Glacier, both flow towards Knight Inlet to the south (not shown). 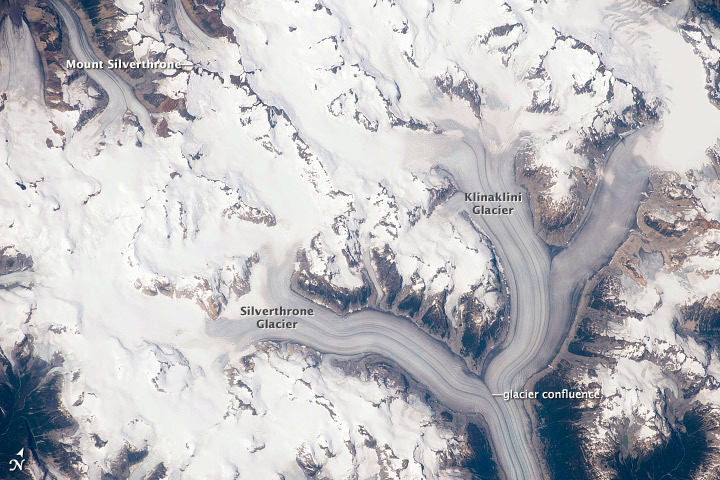 Several moraines—accumulations of rock and soil debris along the edges and surface of a glacier—are drawn out into long, dark lines by the flowing ice, and they extend along the length of both glaciers. 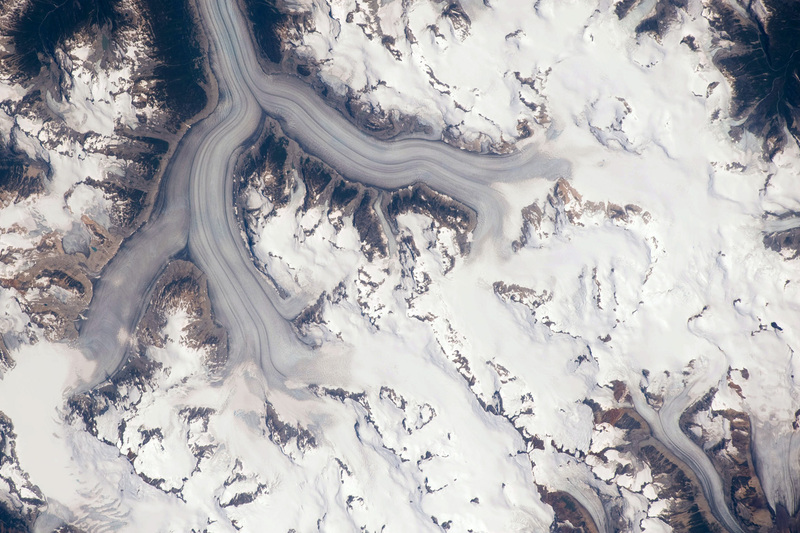 The confluence of the two glaciers at image center illustrates how a moraine located along the side of a glacier can become a medial moraine, in the center of the joined ice mass. Smaller valley glaciers are visible near Mount Silverthrone. Astronaut photograph ISS020-E-29216 was acquired on August 6, 2009, with a Nikon D3 digital camera fitted with a 400 mm lens, and is provided by the ISS Crew Earth Observations experiment and Image Science & Analysis Laboratory, Johnson Space Center. The image was taken by the Expedition 20 crew. The image in this article has been cropped and enhanced to improve contrast. Lens artifacts have been removed. The International Space Station Program supports the laboratory to help astronauts take pictures of Earth that will be of the greatest value to scientists and the public, and to make those images freely available on the Internet. Additional images taken by astronauts and cosmonauts can be viewed at the NASA/JSC Gateway to Astronaut Photography of Earth. Caption by William L. Stefanov, NASA-JSC. This detailed astronaut photograph shows Canada’ Heiltskuk Icefield—mostly covered by snow across the upper mountain slopes—and two major valley glaciers that extend from it.